"During the third quarter of 2018, our portfolio of high quality, natural gas pipelines performed very well, generating 30 percent higher net income per common unit than in the same quarter last year," said Nathan Brown, president of TC PipeLines, GP, Inc.
"Our strategically located pipelines continue to benefit from increased natural gas flows, largely out of the Western Canadian Sedimentary Basin, and from additional contracting, both of which are contributing to our current results." "We have a healthy balance sheet and strong coverage ratios." continued Brown. "We have made significant progress in our response to the actions of the FERC earlier this year, and look forward to finalizing our regulatory strategy by year's end. Our reliable and diversified pipeline assets are in high demand and we are pursuing further appropriately sized, well-placed and well-timed organic expansion opportunities. Our Portland XPress project is a good example of our ability to economically and efficiently expand our existing infrastructure." The $7 million increase in equity earnings was primarily due to higher equity earnings from Great Lakes as a result of the elimination of Great Lakes' revenue sharing mechanism beginning in 2018 as part of the 2017 Great Lakes settlement. Additionally, there was a slight increase in Great Lakes' incremental short-term sales during the current period. 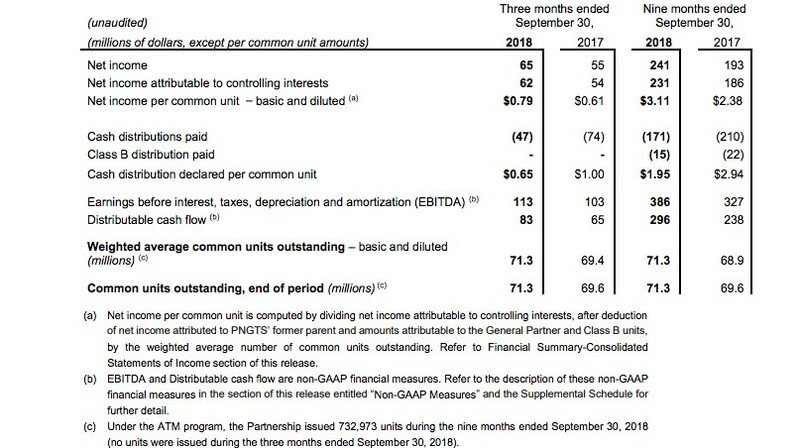 The Partnership's net cash provided by operating activities increased by $43 million for the nine months ended September 30, 2018 compared to the same period in 2017 primarily due to the net effect of (i) higher cash flow from operations at PNGTS and North Baja due to their increased revenues, (ii) the addition of quarterly distributions from Iroquois for the full nine months in 2018 as compared to the period from June 1 to the end of September in 2017, and (iii) higher distributions received from Great Lakes due to an increase in its revenue related to its increased contract levels.